This is an easy week for us, since on Wednesday we are going to my sister's house to spend a couple of days. After that, we will be shuttling back and forth to other family, so I am really only cooking at home 2 days this week. Boil egg noodles while putting mix together. For the mix, in a separate pan, put the olive oil into a pan, then saute the mushrooms. Then add the water, beef and onion mix. Once it is warm through, whisk in the sour cream. Once egg noodles are done, drain and add to beef mixture. This is so good, you will never know that it was done in about 15 minutes! 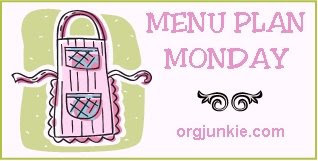 For more menu planning ideas, scoot on over to Organizing Junkie.